HIROSHIMA, Japan — Nearly 71 years after an American bomber passed high above this Japanese city on a clear August morning for a mission that would alter history, President Obama on Friday called for an end to nuclear weapons in a solemn visit to Hiroshima to offer respects to the victims of the world’s first deployed atomic bomb. Writing in the Hiroshima Peace Park guest book, Obama called for the courage to “spread peace and pursue a world without nuclear weapons.” In later remarks, he said that scientific strides must be matched by moral progress or mankind was doomed. Obama’s visit, the first to Hiroshima by a sitting U.S. president, had stirred great anticipation here and across Japan among those who longed for an American leader to acknowledge the suffering of the estimated 140,000 killed during the bombing on Aug. 6, 1945, and its aftermath. That figure includes 20,000 Koreans who had been forced by the Japanese military to work in the city for the imperial war machine. Three days later in 1945, a second U.S. atomic bomb in Nagasaki killed a total of 80,000, including another 30,000 Koreans. Most of those killed in both cities were civilians. The Japanese emperor announced his nation’s surrender a week later. On Friday, people lined streets as Obama’s motorcade entered the city. The presidential limousine pulled up behind the Peace Memorial Museum. In the park, guests were seated just in front of the curved, concrete cenotaph that pays tribute to the dead with an eternal flame burning just beyond it. The Genbaku Dome, or A-bomb dome, the preserved, skeletal remnants of a municipal building destroyed in the blast, was visible in the distance. National security adviser Susan E. Rice and Ambassador Caroline Kennedy walked out from near the museum, along with their Japanese counterparts, followed by Obama and Japanese Prime Minister Shinzo Abe. Then Obama was handed a wreath and laid it on a stand in front of the cenotaph. He bowed his head and stood silently for a minute. Abe then did the same. The president called for nations to reconsider the development of nuclear weapons and to roll back and “ultimately eliminate” them. 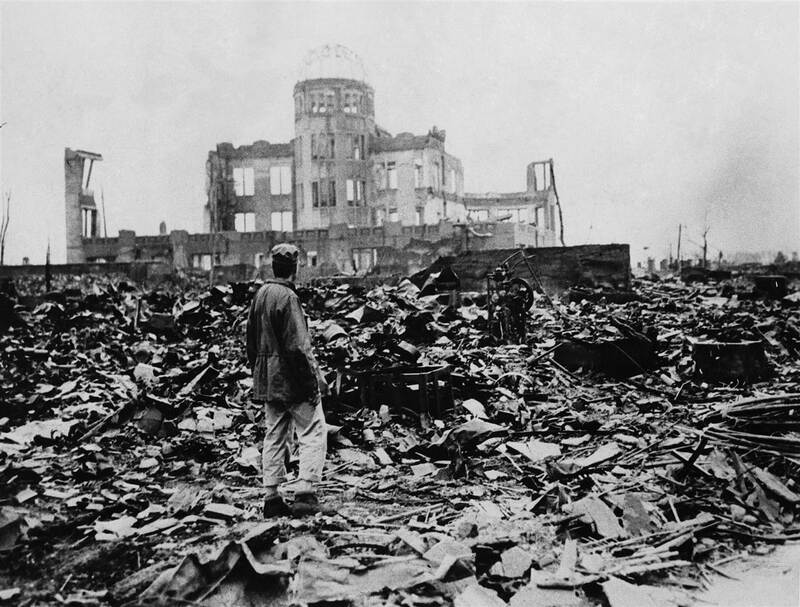 The United States atomic bombing of Hiroshima, Japan, on Aug. 6, 1945, killed 140,000 people and nearly destroyed the city. After the remarks, Obama and Abe walked to the front row to greet Sunao Tsuboi, a survivor of the atomic blast, who stood up clutching a walking cane. Then Obama greeted Shigeaki Mori, another survivor, giving him a hug. The president and prime minister then walked north toward the dome. Reporters rushing to get photographs of the two got involved in an aggressive shoving match with Secret Service agents and Japanese security officials. Obama and Abe stood together gazing at the dome for several minutes. Abe appeared to be explaining the significance to Obama. To their left was a statue of Sadako, a child who died of radiation and became known for her colorful paper cranes, which have become a symbol of Hiroshima’s effort to promote peace. Obama’s motorcade snaked back through the city to the helicopters waiting to ferry the president on the start of his journey home after a week-long Asian trip. Obama’s visit was infused with symbolism for the two nations that have evolved from bitter World War II enemies into close allies. The Iwakuni base, where U.S. Marines work side-by-side with Japanese forces, “is a powerful example of the trust and the cooperation and the friendship between the United States and Japan,” he said. Previous U.S. presidents had avoided Hiroshima over fears that a visit would be regarded as an apology for President Harry Truman’s decision to authorize the bombings, which historians say were carried out in an attempt to avoid a planned invasion of Japan. But Obama and his advisers believed the time was right, in his final year in office, to make the pilgrimage — not as an apology but rather to highlight the alliance between the two nations and to warn of the dangers of modern nuclear weapons exponentially more powerful than the bombs dropped in Japan. Obama has had mixed success in reducing and safeguarding global stockpiles of nuclear weapons and fissile materials. Aides said he hoped his visit, with seven months left in office, would reaffirm the U.S. commitment to nuclear disarmament and nonproliferation. For Obama, another challenge is to use the visit to advance the process of reconciliation in the Asia-Pacific region, where old wartime grievances have been slower to heal than among some of the European combatants of World War II. Obama sought to make clear that while all sides suffered, all sides also bear responsibility for the horrors of war, even as Japan and its neighbors continue a bitter debate over long-ago wartime atrocities. The White House has said it would welcome Abe to Pearl Harbor, where plans are underway to mark the 75th anniversary of the Japanese attack on Dec. 7. One senior U.S. official said he would be surprised if Abe did not come, though the prime minister said at a news conference this week that he had no such plans at this time. Abe reminded reporters that he gave a speech to the U.S. Congress during a state visit to Washington last spring that reflected on the war and the sacrifices of Americans. The prime minister also accompanied Obama on a tour of the World War II Memorial, where Abe laid a wreath and prayed for the souls of the dead.